We interrupt our beauty programming for today’s GIVEAWAY, which is all about shopping. CONTEST OVER - BUT YOU CAN STILL USE THE DISCOUNT CODE! 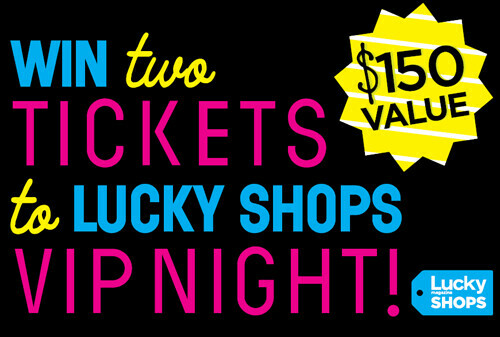 Lucky Shops is a unique shopping event in NYC (at the Highline Stages) opening on Nov 4th and running through the 6th. It’s chock full of designer deals up to 70% off from folks including Rebecca Minkoff, Botkier, Rachel Roy, Foley & Corina and so so much more. See the list here. I’m partnering with Lucky to give away a set of 2 tickets for you and a friend to attend the VIP opening night charity event on November 4th from 6-9pm. These tickets are $150 EACH! First dibs on the deals and a fun party (I’ll be there with bells on) … what else can you ask for? If you live in the NYC area or can get yourself here for November 4th, enter below! If you’d like to buy tickets for the night or the weekend shopping event, you can get ‘em 15% off with my code holierthannow here. (That’s my other blog, case you didn’t know). 2. Leave a DISQUS comment below and tell me WHAT YOU’LL BE BROWSING FOR - A NEW BAG? A NEW COAT? HOLIDAY GIFTS FOR YOUR FRIENDS? Don’t comment in “Ask Me Anything."